Bob Fosse is an amazing choreographer who has left an indelible mark on the world of musical theater. But he has also directed movies along with having written and even edited some. It certainly makes for a rather diverse body of work that helps make him such a memorable figure in entertainment history. So I suppose it only made sense that Bob Fosse would direct and choreograph the movie version of Sweet Charity, given he had performed the same roles for the stage musical that this film was based on. And the movie is quite the unique movie musical experience starring a rather young Shirley MacLaine in the lead role - something that may seem almost surreal to current audiences who may remember her more for her many roles as a mother figure. And while I have somewhat mixed feelings about Fosse's abilities as a movie director, there's no questioning the artistry that he is able to pull together given a strong melody and a host of talented dancers. And this movie certainly has more than its fair share of moments of brilliance. 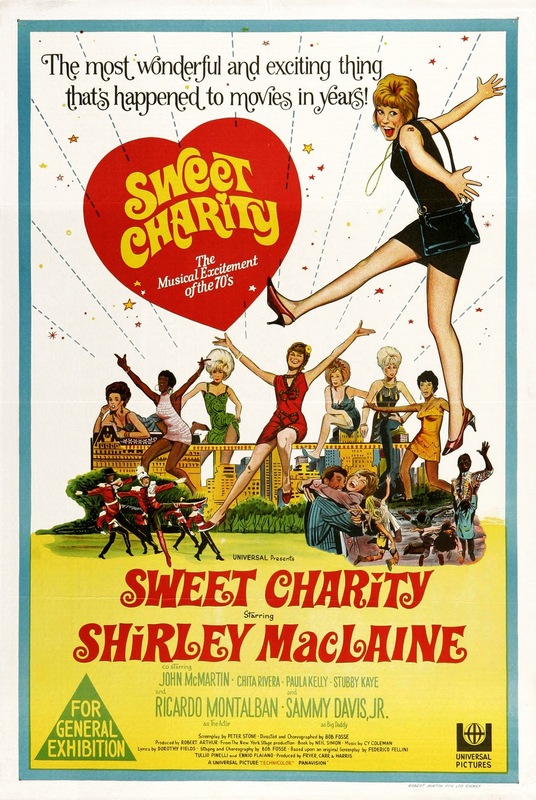 Synopsis: Sweet Charity is the 1969 movie musical adaptation of the stage musical of the same name. Both had been directed and choreographed by Bob Fosse with a screenplay by Peter Stone. Charity Hope Valentine (Shirley MacLaine) works as a taxi dancer at a dance club. For younger folks out there, a taxi dancer is a girl you could hire as a dance partner for the night given most dances at the time had rather specific steps. She seems to have the worst luck with men despite her best efforts, and yet she still remains fairly optimistic about life. But one strange accident leads to another and she manages to cross paths with Vittorio Vitale (Ricardo Montalban), a famous actor. And Vittorio brings her along into his dazzling world of exclusive clubs and fine living. In time Charity meets Oscar Lindquist (John McMartin) as they end up stuck in an elevator together. They soon start seeing one another on a more serious level, although Charity continues to hide the truth of her job as a taxi dancer. And as much as things going to be swell, the truth of her "career" continues to gnaw at her until she finally breaks and tells Oscar everything. The movie has some of the most spectacular dance numbers in recent memory. The centerpiece performance was definitely the now famous "Rich Man's Frug", which is a rather elaborate series of dances consisting of "The Aloof", "The Heavyweight" and "The Big Finish". Admittedly this was my main reason for watching the movie after having watched a clip online. And while we had watched a local staging of the play, their version of the number didn't quite have the same impact as this one production. This is not to say that that is the only performance worth watching. Fosse really pulled out all the stops to make each dance routine truly movie-worthy with now iconic songs like "Big Spender". Combined with the striking costumes of Edith Head, this movie really leaves quite a mark among such musical ventures. At the same time though, I have to admit that I have somewhat mixed feelings regarding Fosse as a director. And while he did win an Oscar for directing Cabaret, I have to admit that I didn't quite enjoy every single moment of it. And my reasons for that are perhaps better seen in this movie given how his narrative segments tend to drag out. His sensibilities seem a bit more ingrained in the theater experience, and thus the musical numbers are fantastic but the straight talking moments tend to be silent. And the sheer difference in tones and the lack of sufficient scoring leaves you wanting to skip beyond the talking and just get back to the dancing. Given her roles in recent years, it's a little hard to resolve the fact that Charity is in fact the Shirley MacLaine. Here she's all bubbly and cheerful, which is prefect for the role of our dear sweet Charity. And she does manage to carry the role throughout the movie. And she really needs to do this - a lot of the movie rests on her shoulders after all. I can see why her acting didn't quite snag her awards, although she at least did get a nomination from the Golden Globes. As a movie, Sweet Charity is a rater striking movie that was a little under appreciated at the time of its release. Now it's a wonderful example of Bob Fosse's skills as a choreographer preserved as a timeless film. And thus the movie gets a good 4 minimalist movements amplified through brilliant plays on contrast out of a possible 5.